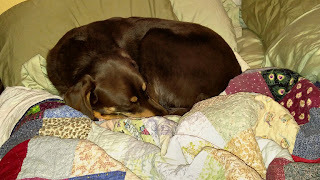 Addy looked so cozy, all curled up on top of the quilt and pillows, I just didn't have the heart to move her and make my bed! Plenty of time to do that when I get home, anyway. Addy has really adjusted well to being along all day. Ev and I were worried that when he went to day shift she would have some issues, but we were pleasantly surprised. What a good dog.